Birding Pawnee National Grassland and Crow Valley Campground. A Spring ritual for Colorado Birders. This post is an over view of our annual one-day birding trip to Crow Valley Campground and Pawnee National Grassland. 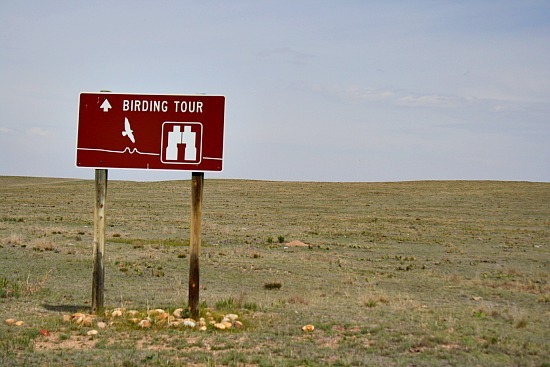 The Pawnee National Grassland is an internationally known birding destination, and how fortunate for us that it’s only about a 2 hour drive from Highlands Ranch. 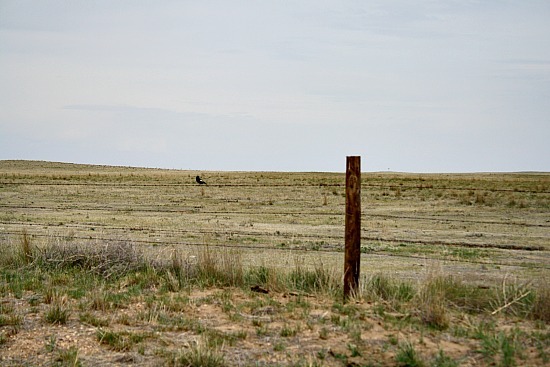 The grassland lies 35 miles east of Ft. Collins. and is a 193,000 acre managed area. Every year, in Mid-may, armed with binoculars, scope and picnic lunch, we make our annual trip to the area. Loading up as early as we can to arrive as early as we can, once you head east out of Ault, the scenery turns to rolling hills and endless vistas. Taking the Briggsdale exit off of Highway 14, we head north and always start our morning by pulling into Crow Valley Campground. Turning onto the road that leads into the campground always triggers intense anticipation over what spring migrants those campground trees have attracted. An oasis to migrating birds in a wind swept prairie, the campground has proved that about anything is possible. The checklist of rarities documented over the years is impressive. A personal favorite past time of mine is searching the branches for a resting Common Nighthawk. 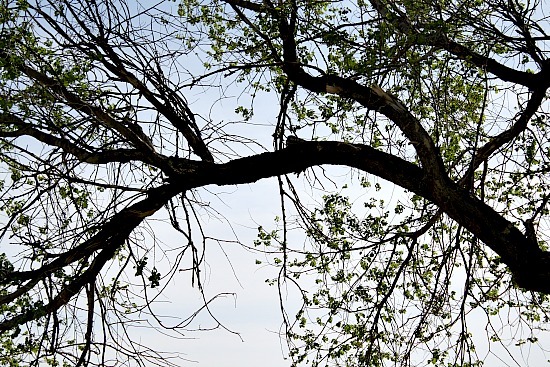 If you look carefully, you can see a bump on the top of the curve of the branch. Bingo! This bird has recently migrated from South America and has arrived in the United States to choose a breeding spot. After scouring the perimeter of Crow Valley Campground, the creek bed and the areas around the baseball fields, it’s time for a little lunch before we head out onto the grasslands. Speaking of the creek bed, this year the creek bed ran dry and I found this nest. 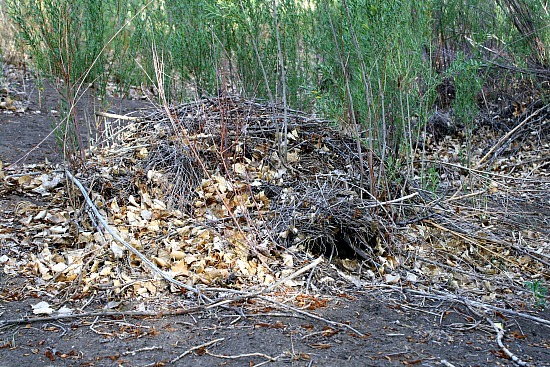 Anyone have a hunch of what lives inside that den of twigs and leaves? Of course I use this trip as an excuse to make it a food event. I mean, after all, ya gotta eat and you part of the charm of this desolate area is that you won’t find any golden arches anywhere in site. 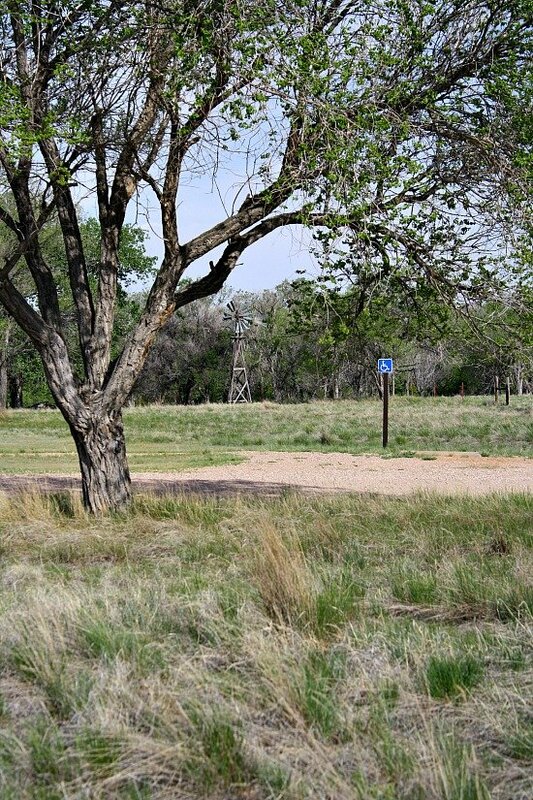 The picnic tables at Crow Valley Campground shaded by Elm and Cottonwood trees are a birdwatchers dream. With binoculars next to our sandwiches, we never miss a moment of the migration show. This year I packed a sandwich I call “The Spaniard”. 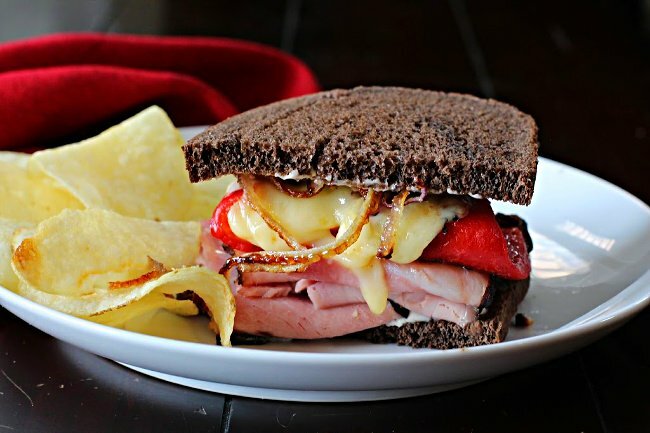 Ham and Manchego cheese with roasted bell peppers and onions on pumpernickel. And with some chips and dip, or a pasta salad, it’s a welcome picnic lunch. After lunch we drive about a mile further north to the entrance of the Pawnee National Grassland Bird Tour. The sign you see in the photo at the top of this post announces that you’ve arrived at the entrance. Fasten your seat belts for a first class prairie grassland Sparrow, Bunting, Longspur extravaganza. Lark Bunting is our Colorado State Bird, and once on the grasslands you can see why it was appointed that honor. Thousands of those black birds with large white wing patches dance across the barren prairie and perch on the barbed wire fences that run along the dirt roads. How I managed to get a photo of one lone bird is a mystery. Navigate those dirt roads at Pawnee National Grassland at a snail’s pace, because if you watch closely, it’s possible to also spot Mountain Plover and Burrowing Owls in the short grass areas. Or if all else fails, an antelope. Swainson’s Hawks are also a common sight on the grasslands. On this trip, we enjoyed a great day of spring migration birdwatching, with a total of 74 species. 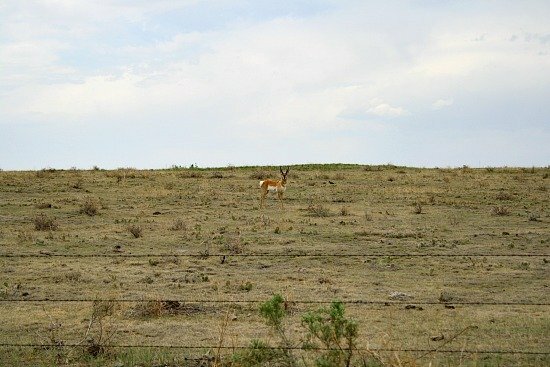 What is the best time to visit Pawnee National Grassland? Personally I think any time of year will yield a nice road trip and a few grassland specialties. To be there during peak migration, is beginning in May – early June. We always try to arrive about the 2nd week of May, keeping in mind keeping a close vigil on the current year migration patterns. 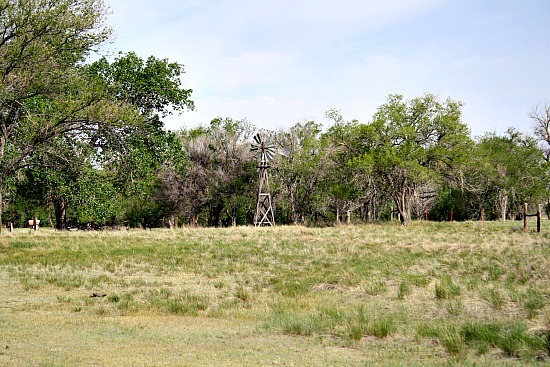 A Picnic and Birding at Pawnee National Grassland, a great way to spend a Colorado Spring Day. And what sandwich was on that picnic table? Ham and Manchego Sandwich is our tradition when birding at Pawnee National Grassland. What would be considered a good quality mayonnaise? I trust anything from Whole Foods, mainly due to flavor. I And actually like 365 Whole Foods Brand with Canola Oil. I also like Best Foods for flavor if you have to grab something at a regular ol market :-). Just nothing generic or reduced fat.